Back in September we summarized the results of the Energy Information Administration’s International Energy Outlook (IEO) for 2017, its global forecast of energy supply and demand. 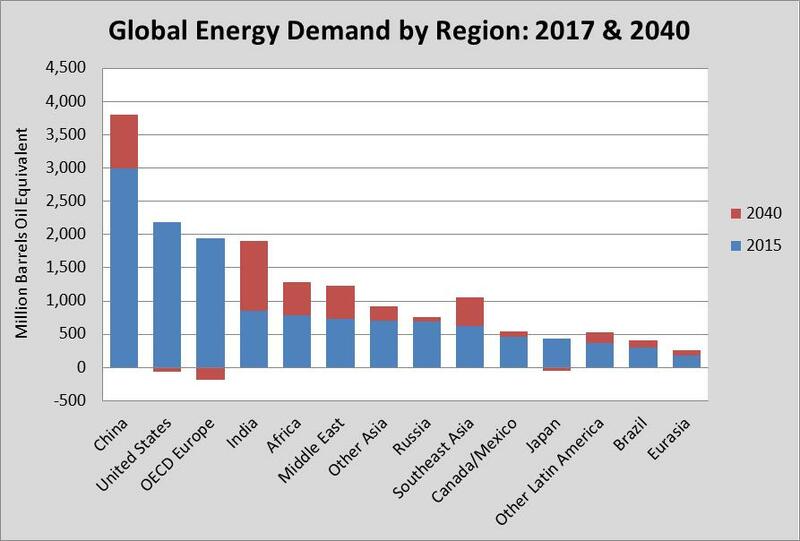 Global Demand Growth: Energy demand between 2015 and 2040 is expected to grow by a bit more than 28%, or 3,770 million tons oil equivalent (mtoe) worldwide. All of the increase in global demand—in fact, more than all (about 3,922 mtoe or 104%) of it—will come from non-Organization of Economic Co-operation and Development (OECD) countries (i.e., developing countries). IEA expects that OECD (developed) countries will see their energy demand decline by about 4% while non-OECD demand jumps 49%. Demand Growth in India Leads the Way: Explosive growth in energy demand in China has been the big story for many years. Although China is expected to account for about 21% of the absolute increase in global energy consumption in the WEO2017, that represents “only” about a 27% increase in that country from 2015 to 2040. The biggest increase in expected to come in India. IEA anticipates that Indian energy demand will boom by 123% over the same period, capturing 27% of the total global increase in demand. Other regions where IEA expects sharp rises in demand include Southeast Asia (70%), Middle East (66%), Africa (64%), and Central and South America (40%). That’s great news for the more than 1 billion people who now live in energy poverty. Hydrocarbon Fuels Continue to Dominate: Combined petroleum, natural gas, and coal use is forecast to grow 18% by 2040, with natural gas leading the way (up 47%) followed by petroleum (12%) and coal (2%). Although the share of energy demand met by fossil fuels declines by 2040, hydrocarbons still are expected to account for 75% of total global demand compared to 81% in 2015. U.S Becomes Global Oil & Natural Gas Leader: IEA expects that within the next decade, the United States will become the “undisputed leader” for oil and gas production. We’ve known for some time about the very large increase in U.S. natural gas production thanks to the application of hydraulic fracturing, horizontal drilling, and advanced seismic imaging technologies to shale formations. Natural gas output will rise from about 750 billion cubic feet in 2015 to 1,060 billion in 2040, an increase of 40%. This will allow the United States to transition from a net importer to a net exporter of natural gas and has set us on a path to become the world’s largest provider of liquefied natural gas before 2030, as global demand for natural gas rises, particularly in Asia. IEA also projects that U.S. oil production, primarily from shale formations, will rise rapidly, from about 12 million barrels per day (MMb/d) in 2015 to nearly 17 MMb/d in the mid- to late 2020s. This astonishing jump in U.S. output could keep oil prices in the range of $50 to $70 per barrel through 2040. (Compared to the $100 per barrel price experienced as recently as 2014.) IEA also projects that when this higher production is combined with lower U.S. oil demand, the United States will become a net exporter of oil in about a decade’s time, something entirely unforeseen a few years ago. Petrochemicals: The sharp increase in oil and natural gas output is going to have large impacts in North America, including investments in petrochemicals and other energy-intensive industries. The recent visit by President Trump to Asia, where the president secured investments for $83.7 billion in shale gas, power, and chemical projects in West Virginia, is a tangible demonstration of IEA’s forecast. Globally, IEA shows 60% growth in petrochemical feedstocks, and while the United States is among the regions showing an increase, China and the Middle East are where most the increases are expected to occur. Electricity Grows Fastest: IEA agrees with EIA that demand for electricity will grow much faster than energy demand. IEA is forecasting a 62% increase in global power generation between 2015 and 2040. The use of fuels to generate electricity, however, grows at a much slower rate (37%) because of a large increase in renewable generation (which requires no fuel inputs). Fuel demand is expected to grow 39% in the industrial sector and 27% in both transportation and buildings. Renewables Use Grows Rapidly: IEA forecasts rapid demand growth for renewable energy (hydropower, wind, solar, biofuels, etc.) of about 86%. By 2040, renewables are expected to account for 20% of overall energy demand. Most of the demand growth comes in the “other renewables” category, which includes wind and solar. Developing countries account for about 70% of the total increase in renewable energy consumption globally over the 2015 to 2040 period. Nuclear: Nuclear power is forecast to grow 49% between 2015 and 2040, and its overall share of demand in 2040 is expected to be about 6%, up a bit from the current 5%. While developed countries will be decommissioning plants and reducing generation of nuclear energy, developing countries are set to expand nuclear generation, especially in China, India, and the Middle East. Carbon Dioxide Emissions: Under IEA’s New Policies Scenario, carbon dioxide emissions from energy (excluding international bunker fuels) go from 30.9 gigatons to 34 gigatons between 2015 and 2040, a rise of 10%. Whereas developed country carbon dioxide emissions are expected to drop by 2.5 gigatons, developing country emissions are anticipated to increase 5.5 gigatons. China’s emissions rise only modestly to 2030 and decline thereafter to 2040. In all other developing regions of the world emissions grow through 2040, with the largest rises in India (2.8 gigatons) Southeast Asia (1.0 gigatons), the Middle East (0.7 gigatons), and Africa (0.6 gigatons). Although the projection for the U.S. does not includes the Clean Power Plan, which the Trump Administration is rescinding, IEA nonetheless estimates that U.S. carbon dioxide emissions from energy will be 16% (0.8 gigatons) below the 2015 level in 2040.